EasyTest language contains less syntactic sugar, so why should I care writing my scripts in C# or VB.Net? I will answer using the words of our good customer Martin Brekhof: The main idea is that when I want to run the same test with (a lot off) different field values using for example a database that this would be easier to accomplish using C#. Since last week i could also see the benefit of something like a report tool for these tests (putting the testresults in a database and use a XAF app to create reports etc.). However EasyTest architecture is flexible enough to allow writing tests from code without having to parse or create (*.ets) files. Our team has prepared an example that demonstrates how to create EasyTest scripts in C#. The sample application is based on the Contact and DemoTask business classes taken from MainDemo. An in-memory data store is used for testing, which is performed via NUnit. The test methods are located in the CommonTests, WebTests and WinTests classes. These classes are derived from a custom base class, providing auxiliary functionality, such as starting and stopping the application for testing. If you look at the test methods, you will see that they look like regular unit tests with lots of ‘Asserts’. Basically, these tests consist of three different types of actions. 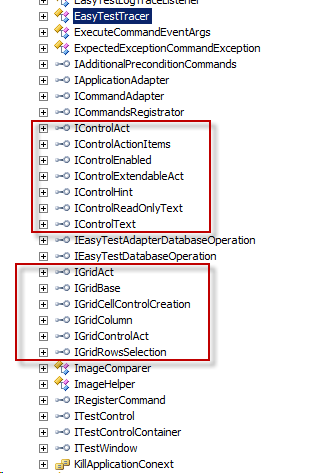 Firstly, you can invoke the adapter.CreateControl method to access application controls. 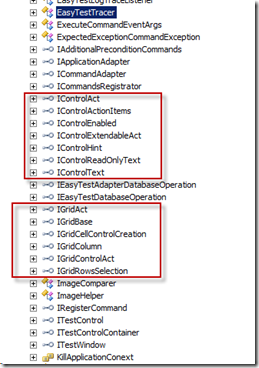 After you get a control, you can query its status via the control.GetInterface method. You will need to specify a valid interface as the method parameter. Most of these interfaces reside in the DevExpress.EasyTest.Framework namespace and begin with ‘IControl’. After you have cast the retrieved control to an interface this way, you can check specific properties, such as Enabled, or invoke methods, such as GetRowCount. This example can be modified to be used with any unit-testing engine and can be extended with additional commands by introducing new methods in the TestCommandAdapter class. You can also modify the command syntax by renaming and modifying TestCommandAdapter‘s methods. The sample application uses active directory authentication, and we kill the application instance and start a new one between tests. If you are using standard authentication, you can reuse the application instance by logging off the application instead of killing it. To do this, modify the TearDown method of the WinEasyTestFixtureHelperBase/WebEasyTestFixtureHelperBase. The following steps are required for a Windows Forms application, too (Program.cs file). That was a full description of how the sample is designed. We would like to hear your thoughts about this approach for testing XAF applications.